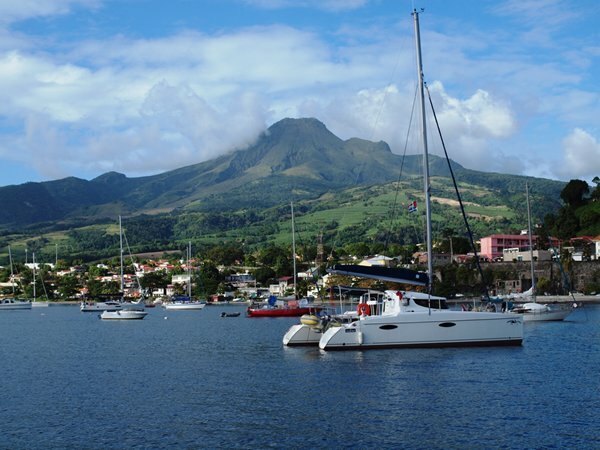 Short sail up the coast of Martinique to the bay of St Pierre which sits under the shadow of Martinique's tallest peak - Mt Pelee. Approx 120 years ago Mt Pelee erupted and wiped out the entire town and sinking all of the ships anchored in the bay - it sounds pretty awful - everyone in the town was killed allegedly apart from one man who was in a stone cell in the prison. The town has been rebuilt but not on the scale it was before - you can walk around the ruins of the theatre and prison etc and they were huge stone buildings - the cathedral was rebuilt about 100 years ago and there are still some nice buildings here from the past 100 years. Here's the view from our boat to Mt Pelee which is often covered in cloud - managed to catch it when it was clear. On thie right hand side of the pic is a stone wall - this is part of the old town walls with cannons and things on top. and here's the view of the town quay, cathedral and old bank - the sign by the cathedral says it had to be rebuild as the english destroyed it. We had to anchor on quite a narrow shelf just off the beach - the sea bed drops off steeply so you have to get the anchor hooked in the shallows - took us 2 goes and seems to take everyone else at least that which makes for good evening entertainment, two attempts is fair to middling, 4 attempts is bad. Someone is now anchored so close to us that they have put fenders out on the side of their boat - unsure if that is good or bad - probably bad that they think they are that close but can't be bothered to move. Been diving the past couple of days looking for the 13 wrecks that are supposed to be sunk in the bay, we can't say we have found 13 - we think that the majority of them in the shallower water have gone by now or been so broken up - but we've done some nice dives and also been able to do our dives together as there are buoys on the dive sites, it's pretty safe here so we tied the tender up to the buoy and so we could both go in the water as there is no current and most of the time we are diving so close to the main boat we could swim back if absolutely necessary! 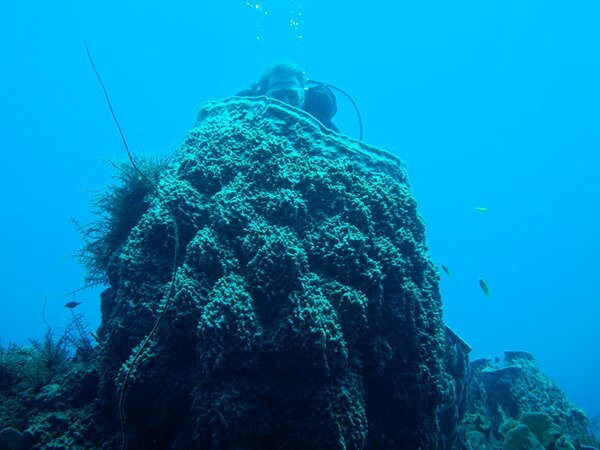 We have dived the main wreck here twice - we think it is a large tug boat sunk by the volcano in 1902 - anyway it is a large-ish boat with huge engines and a huge bow - it's covered with fish but quite deep so we only got 15 minutes at exploring hence the need for 2 dives to do all of it. We've done some other dives around the reefs and although no wrecks - it's been quite nice. We've done 3 days diving here now though so tomorrow plan to go and visit the local rum distillery and do some walks ashore. 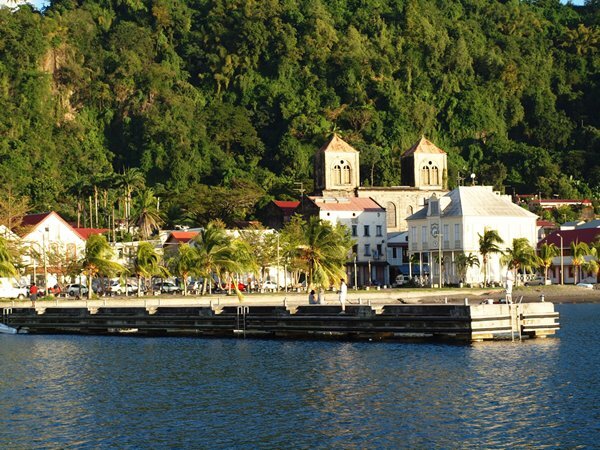 Hopefully Tuesday will see us sailing to the isles of the Saints (or Les Saintes as they say en France) - these are just off the south coast of Guadeloupe - it will be our longest sail in over a month - 72 miles!!! We've been looking for the mythical 'green flash' over the past few days when we remember - it's not a super hero, apparently when the sun goes down here the very last bit of the sun before it disappears on the horizon turns green. We think we have seen it - wouldn't really call it a flash - but the final second or so of visible sun does seem to go bright green just before it vanishes. 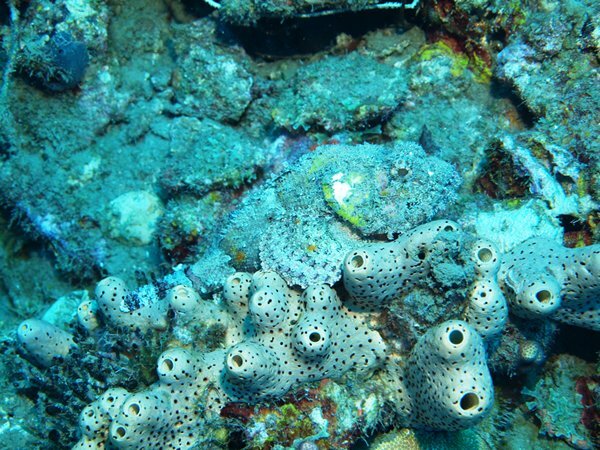 Spot the fish game - there is a scorpionfish hiding in the picture somewhere. . . . . .